LABYRINTH AROUND AMERICA COMES TO SHELBURNE FALLS, MA! Labyrinth Around America – a project launched by Englishman Clive Johnson to take a labyrinth (a path printed on a large canvas) around all border states of the continental USA – is set to arrive in Shelburne Falls in early November. “The project aims to introduce both individuals and communities to the time-honoured practice of labyrinth walking, which has gained massive popularity in recent years,” explains Johnson, who offers the walks for free. “Walking a labyrinth offers a way to meditate, and to escape from the everyday for a short while,” he says. 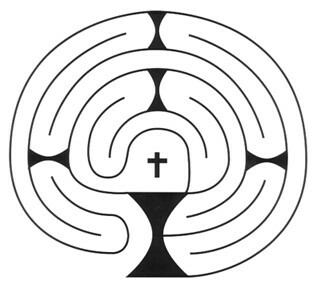 The popularity of labyrinths has been growing at a time when many people feel worn out by the busyness of modern life. There are now thought to be more than 10,000 labyrinths in the US alone, found in settings as diverse as public parks and university campuses. Meditative body, mind & spirit weekend with Reflective Art Journaling, Labyrinth Walking, Drawing, Finger Labyrinth DIY and Tai Chi to expand the body and spirit. Come join Sadelle Wiltshire and Debbie Yaffee for a relaxing, meditative weekend in exploring the Labyrinth as a tool for personal transformation, body awareness, mindfulness, spiritual growth and a whole lotta ART! We will start and end the weekend with a guided labyrinth walk to get to know each other and create our sacred circle for the weekend. We'll be doing some reflective written and visual journaling, learn to draw labyrinths in a focused meditative way and incorporate them into our journals. We will give focus to our body, as well as mind and spirit with easy Tai Chi exercises on the labyrinth. The weekend will also include optional/free time included for more art journaling, Zentangle drawing meditation, creating finger labyrinths, body care, reflection, walks and/or rest. Check out our Past Events (below)....to help you know us better! TREAT YOURSELF TO A SPIRITUAL SPA DAY! MA Nursing CEUs Available on request! Join us for a day of relaxation and rejuvenation. Attendees will have a choice of five different workshops to attend over the course of the day. A tasty, healthful lunch will be provided. Participants will have a choice of attending three workshops in the morning and two workshops in the afternoon. Depending on interest levels and number of attendees, we will try our best to accommodate requests. Workshops will be 45 minutes in length. The indoor portable labyrinth and, weather permitting, the outdoor labyrinth will be available for walking during the day. This workshop is free (though offerings will be graciously accepted).